The constellation Bootes. Roll mouse over to see labels. 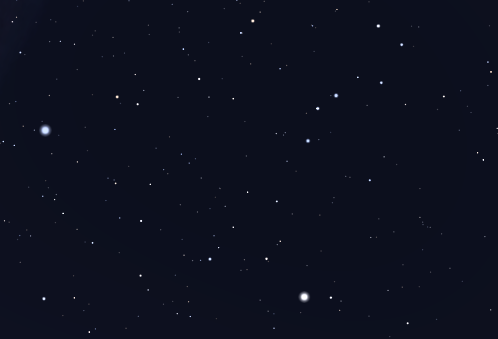 Boötes is a large northern constellation, dominated by the fourth brightest star in the whole sky, Arcturus. Visible in the months around May, it is also home to a further six stars that are brighter than fourth magnitude, and nearly thirty that are visible to the naked eye from a dark site. It lies well away from the plane of the Milky Way and so does not contain any bright open clusters. It is, however, home to the ninth-magnitude globular cluster NGC 5466 as well as many faint galaxies. Boötes is identified as a herdsman, but the origin of his name is unclear. He is commonly represented as Arcas, the son of Zeus and Callisto, who features in the story of Ursa Major the great bear. Bootes contains the following Caldwell object: C45. 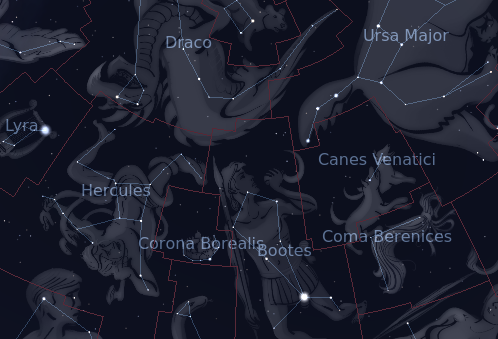 The following constellations neighbor Bootes: Canes Venatici, Coma Berenices, Corona Borealis, Draco, Hercules, Serpens Caput, Ursa Major, Virgo.